Sea Whisper Guest House - Jeffreys Bay Accommodation. STAY ON THE EDGE OF AFRICA! Sea Whisper Guest House overlooks the pristine beaches of the Indian Ocean. 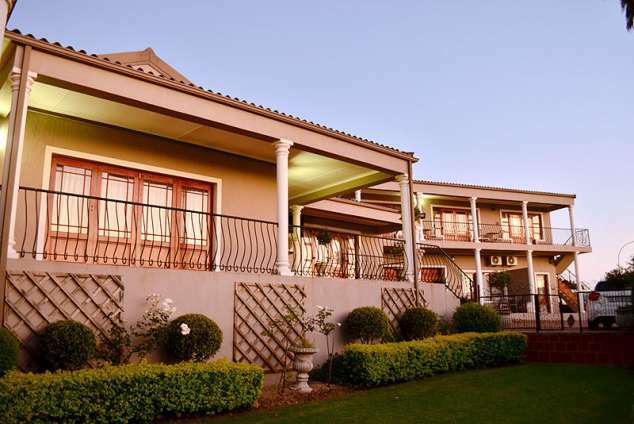 The property, less than an hour's drive from Port Elizabeth is set in luscious, tranquil gardens with stunning sea views and adjoins a small nature reserve. Guests can relax and unwind in this upmarket villa-style accommodation, suitable for both corporate stays and family holidays. The Guest House comprises of 7 beautifully appointed air conditioned en suite rooms with private entrances and patios. Rooms are elegantly furnished, offering guests a combination of king, queen or twin beds, dressed with crisp white linen. Guests can fall asleep listening to the sound of the nearby ocean, creating the ambience for a soothing and serene stay. All rooms offer complimentary guest amenities, complimentary WIFI, hospitality trays and satellite television, bar fridges, hairdryers and when chilly, electric blankets. Guests have a choice of standard or deluxe rooms offering sea views, garden and valley landscapes or a combination of both. Leisurely breakfasts can be enjoyed in the breakfast room or on the breakfast terrace, which overlooks the Indian Ocean and an elevated pool deck which adjoins a small nature reserve. Situated at the Eastern edge of the Garden Route and Route 62, on the doorstep of the Baviaans Wilderness Reserve, 170km from Addo National Elephant Park and 50 minutes drive from Port Elizabeth, Jeffrey's Bay offers visitors numerous activities. Guests can explore the magnificent beaches, a blue flag beach included, learn to surf, go horse riding along the beach or enjoy some shopping at the Billabong factory shops. Take time out to do some rock and surf angling or just relax and watch one of the spectacular sunsets that Jeffrey's Bay is so well known for. For the more adventurous there is the Tree Canopy Tour at Tsitsikamma or Bungy Jumping at Blaaukranz. 33745 page views since 23 Aug, 2005. Last updated on 31 Aug, 2018.